A 2-year-old boy presented with opisthotonos and gait imbalance. The patient reported several episodes of vomiting over the last month. A sinus tract near the external occipital protuberance was also noted. Fundus examination showed bilateral papilledema. 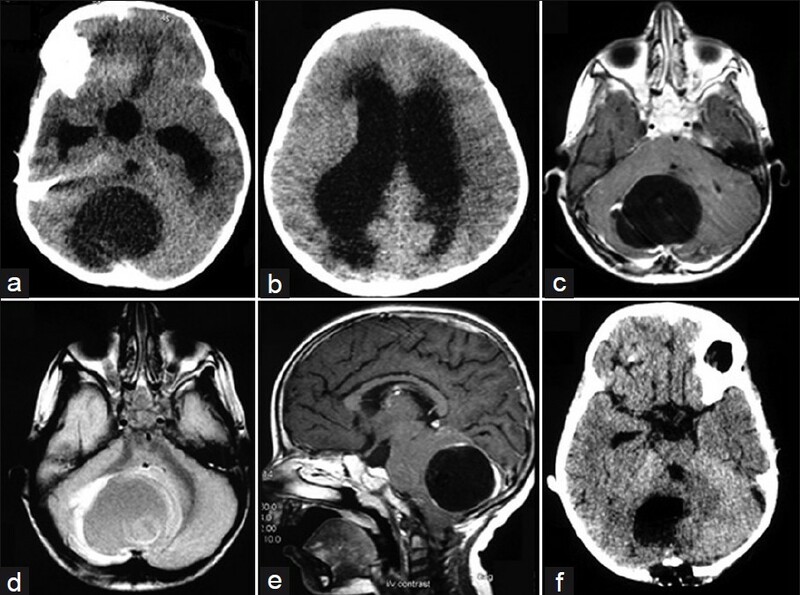 CT that ensued revealed a posterior fossa cystic lesion causing obstructive hydrocephalus [Figure 1]. An emergency external ventricular drain (EVD) was placed. Subsequent Magnetic resonance imaging (MRI) revealed a 50 × 35 × 35 mm cystic lesion behind the 4 th ventricle with a 10 mm solid component. Given the presence of the sinus tract, dermoid cyst was the most likely diagnosis [Figure 1]. The patient was operated upon. A dermal sinus tract was identified that extended intracranially. The cyst wall was carefully mobilized and excised completely. Histological examination verified the presence of a dermoid cyst. Postoperative the patient was neurologically intact and the EVD was removed on postoperative day 8. On follow-up MRI carried out 4 months later, no cyst recurrence was noted. 1. Alexiou GA, Sfakianos G, Prodromou N. Intracranial dermoid cysts in children. Arch Argent Pediatr 2010;108:191-2. 2. Layadi F, Louhab N, Lmejjati M, Aniba K, Aït Elqadi A, Aït Benali S. Cerebellar dermoid cyst with occipital dermal sinus. Report of two pediatric cases. Pediatr Neurosurg 2006;42:387-90.